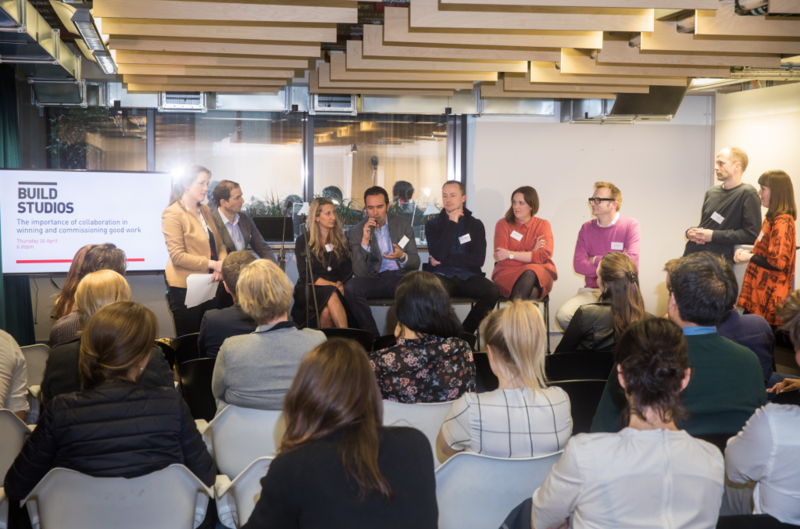 Guests gathered at Build Studios on 26 April to hear tips from an expert panels of Speakers on the importance of collaboration in winning and commissioning good work. From large private sector clients to public sector procurers, a number of common themes emerged about why small companies can often have the edge when pitching for work. Commissioners want submissions that are concise, creative and show off the talents of all team members – not just one star player. From the perspective of those pitching for work, despite frustrations at the bureaucracy of public tenders, speakers gave great examples of where collaborations have helped win commissions. Repeat collaborations with with trusted fabricators can ensure that a project remains profitable for all parties. Collaborating with local communities through crowdfunding campaigns has raised funding to get a number of projects off the ground; and early collaboration with the procurers themselves whilst the brief is still being developed has helped build understanding between both parties, resulting in a more realistic brief and a better end result all round.